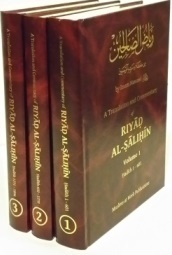 Riyad al-Salihin is an Arabic collection of ahadith by Imam Nawawi Rahimahullah, the great scholar of hadith and fiqh of the seventh century Hijri. It deals with various aspects of Islamic belief and conduct and covers a wide range of topics such as etiquette, manners, morals, supplications, beliefs, worship, human interactions, etc. It contains ahadith from the six canonical compilations of hadith: Bukhari, Muslim, Tirmidhi, Abu Dawud, Nasai and Ibn Majah. This English publication contains the Arabic text, English translation, commentary, vocabulary and brief biographical notes about the narrator.